“We can be proud of the many orders that our industry has taken in 2017, despite the many challenges faced,” says Bas Ort, chair of the Netherlands Maritime Technology (NMT) trade association. Despite the beginnings of a recovery that became apparent in 2017, turnover still decreased by some five per cent during the year, from €7.3 to €6.9 billion for yards and suppliers collectively. The total workforce decreased by a little over three per cent, from nearly 29,000 FTEs in 2016 to 28,000 FTEs in 2017. The decline in both figures now appears to have levelled off. A cautious recovery became apparent in the global shipbuilding industry in 2017, especially over the final months of the year. This was very welcome after the disappointing figures of 2016. However, even though the new orders made in 2017 accounted for more than twice as large a tonnage as in 2016, this was not nearly enough to provide work for all the world’s yards. As a result, the global order books decreased even more, and a number of yards found themselves in difficulties. The effects were especially visible in China and South Korea, while European shipbuilders were the only ones to experience an increase in the order books. A total of 58 seagoing vessels were delivered in 2017 (compared to 42 in 2016). Fifty-six new vessels were ordered in 2017 (42 in 2016) with a value of €1143 million (€642 million in 2016). The export share was 57% (79% in 2016). The turnover of the approximately 800 maritime suppliers in the Netherlands amounted to €3.4 billion in 2017 (€3.8 billion in 2016). 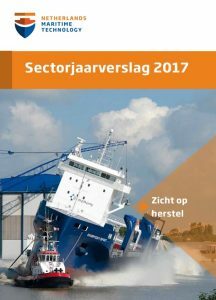 Total employment among Dutch maritime suppliers was 16,413 FTEs in 2017 (16,838 in 2016). Additionally, they employed an average of 1,460 FTEs of temporary workers during 2017. Turnover in 2017 was €381 million (€442 million in 2016). Total employment was 1,710 FTEs (2,020 in 2016). There were 155 vessels delivered in 2017 (116 in 2016). The order book contained 198 vessels on 31 December 2017 (126 in 2016). Twenty-five superyachts were delivered in 2017 (19 in 2016), with a value of €1.2 billion (€1 billion in 2016) and 18 new commissions were received (17 in 2016) worth almost €1.2 billion (€1.3 billion in 2016). The order portfolio at the end of December contained 57 superyachts (66 in 2016) with a value of almost €4.5 billion (€4.6 billion in 2016).